A look at some of the top uncommitted 2019 prospects at the ACIT. No player on this list has seen his star rise as quickly as Nkamhoua, who has emerged as one of the area’s top uncommitted prospects. Tennessee, Pittsburgh and Maryland became the latest programs to join the fray, extending scholarship offers to Nkamhoua this week. Terrapins Maryland head coach Mark Turgeon came to see his 23-point, 12-rebound performance against St. Maria Goretti on Saturday, and several other D-I assistants watched him throughout the week. Arkansas offered him Sunday. A native of Finland, the 6-foot-8 Nkamhoua was originally at Richard Montgomery (Md.) but suffered a leg injury that kept him off the court. He transferred to Bishop Walsh in the fall and is showing what he can do when healthy. He posted double-doubles in all three of his Alhambra games, averaging 18.6 points and 10.6 rebounds for the week. When I profiled him back in December, Nkamhoua's scholarship offers were Kennesaw State, Mount St. Mary’s, Siena and UMass-Lowell. Since then he’s added Illinois, Minnesota and Wake Forest, in addition to the trio this week. Nkamhoua said last Thursday that he would turn his attention to his recruitment right after the season ended, but that was before his options expanded. “I’m going to sit down, choose maybe four visits to take and start really looking at these schools seriously and make the best choice for me.” he said. Baker was one of the contingent of players who moved from St. James (Md.) to Bishop Walsh along with head coach Dan Prete last summer. A native of Canada, the 6-foot-2 Baker currently holds offers from Bowling Green, Fairleigh Dickinson, Hofstra and UMass-Lowell, and said he’s also talked with Denver, Richmond and Wagner. Baker’s best game of the week came in an 18-point performance against Mount St. Joseph, as he helped the Spartans win their first Alhambra game since 2011. He finished 5-of-6 from the field and 4-of-4 from 3-point range. Another St. James transfer, the Canadian import impressed with his toughness and heads-up play throughout the event. Torelli’s best game came in the Spartans’ win over Mount St. Joseph on Friday, as he posted 15 points on 4-of-9 shooting and hit two 3’s. He averaged 11.6 points per game in three Alhambra contests. Blakney made impact plays on both ends of the court all tournament, leading the Gaels to a First-Place Consolation Bracket finish. The 6-foot-6, 192-pound Blakney averaged 18.3 points per game in three contests at Frostburg State. 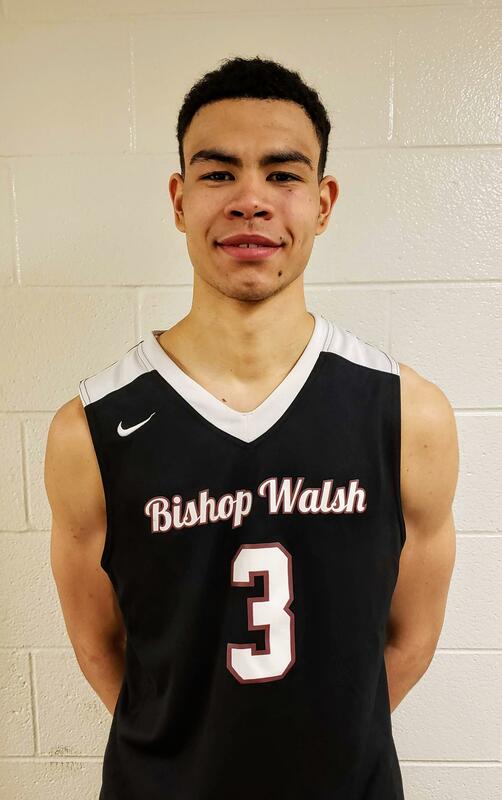 He carried the offense in the second half of a big closing win over Bishop Walsh on Saturday, scoring 14 of his 16 points after the break to help the Gaels rally from a double-digit deficit. He had a game-high 21 in a win over St Frances on Friday. Blakney's listed offers include Hofstra, Mount St. Mary's, St. Bonaventure, Towson and UMBC. He said Clemson and Georgia Tech have shown some interest as well. Edwards is a consistently impressive performer who does an excellent job of getting the Gaels going. The 5-foot-10 Edwards doesn't force anything, but finishes nicely and is a steady threat from behind the 3-point arc. He's strong and a willing defender who has attracted heavy Division II interest. A second team All-Baltimore Catholic League selection, Golek didn't put up big numbers at Alhambra but impressed with his efficiency. A native of Poland, the 6-foot-4 Golek opened with 10 points on 3-of-5 shooting, including (2-of-3 from 3-point range. He stayed in that same range all week, and finished up 8-of-10 from the field (4-of-5 from deep) while contributing in a a variety of ways - particularly on the defensive end. Golek still seems like a fairly unknown commodity, and the type of player who would benefit greatly from a prep year to raise his profile. The 6-foot-4 Gill enjoyed a productive season in an expanded offensive role, helping the Purple Eagles win the Washington Catholic Athletic Conference title. Gill’’s versatility was on display in Frostburg, as he averaged 13 points per game and made significant contributions in a host of other statistical categories. He went for 19 points in a Saturday loss to St. Frances, making several highlight-reel plays while helping to keep Gonzaga in striking distance. After battling through some injuries early in his career, Gill has proven what he can do when he's healthy. He currently holds scholarship offers from Loyola (Md. ), Mount St. Mary's, Robert Morris and Siena, and will be a great value for a team at this point in the recruiting calendar. The 6-foot-8 Murphy was quiet offensively, but is willing to do the dirty work on the offensive and defensive boards and made his presence felt in the post. Murphy has the makings of a solid post defender. He's strong and doesn't mind mixing it up one-on-one - he's hard to push off of his spot - and he's also an asset on the help side. Murphy's listed offers include Monmouth, NJIT, Old Dominion, Robert Morris and Siena, but hasn't indicated that he's leaning any particular way right now.